It shows a-typical Web page that prompts the user to enter information, which will be used later to extract information from a database on the server. 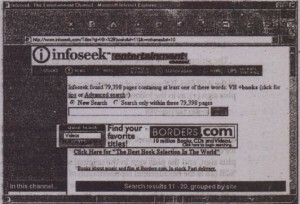 The site shown is Info seek, a widely used search engine on the Web. The search argument is “VB +books” (search for documents about “·VB” that also contain the word “books”) . 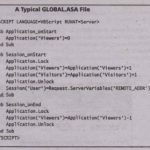 Titles is the name of an application on the server that will search the database and supply the results. It’s not an ASP application. but it doesn’t make any difference. The same arguments would be supplied if it were an ASP application. 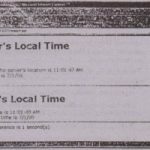 the same document would be returned to the client. The client must transmit the name of the application that will process the parameter values on the server; that’s all the client needs to know. 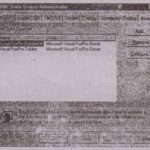 This piece of information is supplied in the <FORM> tag of the document. 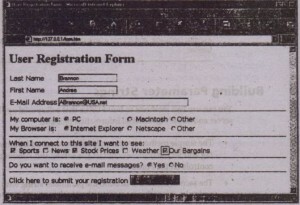 Start Internet Explorer, connect to the ~ site, and submit some search arguments ..When the server returns the requested information, you’ll see the name of the application that retrieved the data on the server along with the arguments (a string to the one shown above) in the Address Box of the browser. The parameters follow the question made, which appears at the end of the URL. In the example of the Info seek site, the first parameter is qt (which, most likely, stands for query text), and its value is the string “VB + books”. The space. was replaced by a plus sign, and the plus sign in the original search argument was substituted with %2B (2B is the hexadecimal representation of the plus sign’s ASCII value). The parameter information tells the application of the server to generate an document without frames, and the param.r st=10 specifies that it shot¥ display the second batch of 10 matching titles. As you can see, the search recalled nearly 80,000 , But they can be displayed on the client 10 at a time. Each time you click the Next 10 hyper Link. the value of sf is increased by 10 (and each time you click the Previous 10 hyperlink, the value of the parameter st is decreased by 10). This is all the information needed by the titles application on the server to display the appropriate me with the results of the search. :the Web server can’t decipher requested URL, but it does have the intelligence to invoke the program whose name appears in the URL string and pass to it the parameter following the program’s name. Traditionally, the programs that process client requests in real time on the server are called scripts, and most of them were written in Perl. • The simple method is to supply all the required information in the <FORM> tag and let the.browser contact the server and submit the values of all the controls on the Form. 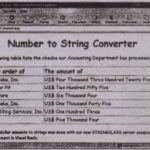 • The second method is to build the parameter string with VBScript commands and submit it to the server. with the Navigate method of the Window object. The Action attribute specifies the URL of the application to be invoked. The application is an ASP file that resides in the ASP pages virtual folder of the same Web site, which’ uploaded the current page:’The METHOD attribute specifies one of the two .method for submitting data from the client to the server. For the examples in this ,we are going to use the GET method. 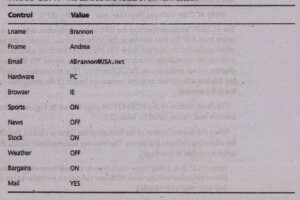 The Form section of the FORM.page shown contains the Controls and values listed in Table. When the Submit button at the bottom of the Form is clicked, the client transmits the following string to the server. The browser automatically builds this string (no· script is needed in this page). The URL String variable is a single long line, but it had to be broken somewhere to fit on the printed page. You would normally build this string in pieces, using the concatenation operator. You should use the first method, which is much simpler, except for unusual situations in which the information to be transmitted can’t be entered in controls. At this point, you probably want to test the information presented so far and see for yourself how the client interacts with the server. 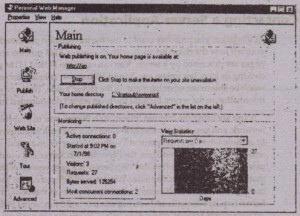 This process requires that your pages are processed by a server. You can open the FORM.HTM page by double clicking its icon, but unless you have a Web server running on your network, you won’t be able to see what happens on the server’s side. The page won’t submit any information to them, because the page wasn’t downloaded from a server. 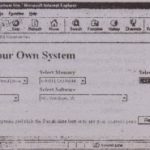 The Personal Web Server comes with Visual Studio 6 and Visual Basic, To install it, you must install the optional package Windows NT Option Pack. Installing the PWS is a totally automatic process. After its installation, the PWS starts automatically whenever you turn on the computer. In the following section, you’ll see how to develop application that run on the server arid can be invoked from the client. These applications are quite simple to develop (probably simpler than you think).They are scripts, just like the scripts you can embed in HI’ML pages, only they run on the server. ‘They are called Active Server Pages, and as a VB programmer, you can start server side scripts immediately. Visual Basic 6 provides a special type of project, the Application type, that automates the process of building Active Server Pages to run on Internet Information Server. Even with the automated tools provided by this application type, you can’t go far without a basic understanding of server-side scripts and the provided by ASP for interacting with the client.